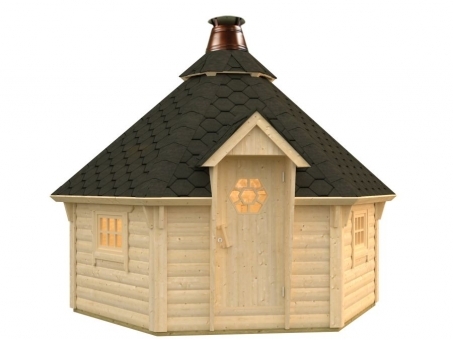 The Staten Island is a traditional hexagonal design Log Cabin with 44mm tongue and groove walls. The roof and floor are 19mm tongue and groove construction and the roof is supplied with ready-made elements with option of a shingles covering. The doorway has a stainless steel protective capping and laminated frame. The windows are double glazed. 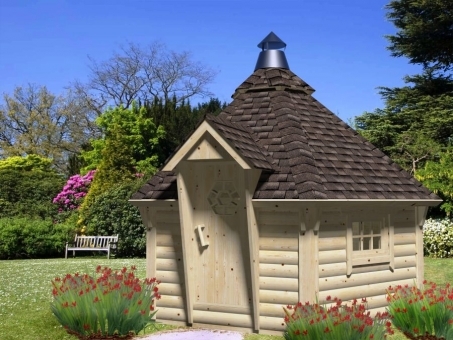 The cabin is supplied unfinished and can be stained or painted in any colour to suit. It has a manufacturer’s 5-year guarantee. Note - also available is a grill with table, smoke extraction hood, chimney and chimney cap or Pizza Oven. Our Staten Island takes outdoor living well beyond the summer house and garden shed. It takes idyllic daydreams of Nordic forests, saunas and long summer nights and brings them direct to your back garden. Entertaining and family life would be so much more interesting if you had an enchanting year-round pizza hut like the Staten Island – Alongside a hot tub – the Staten Island will impress everyone that visits. 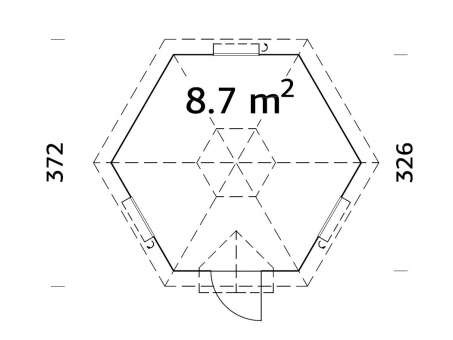 Staten Island is a hexagonal solid-timber BBQ hut with Nordic design details and 19 cubic metres of interior space. The readymade roof elements include a chimney, and there's an optional grill with table and smoke extraction hood. Other people's conventional barbecues and patios would seem mundane and dull in comparison. The added beauty of our Staten Island cabin is that you can use it all year round. Open the doors and windows to enjoy a warm summer evening or hunker down inside when the weather turns bad. The solid timber walls are 44mm thick, the windows are double glazed, and both floor and roof are real wood. Barbecuing in the depths of winter - that's special. The design uses readymade roof elements, making it easier to construct. There's also an option to add roof shingles if you want to enhance the Nordic appearance of the steeply pitched roof. All fixtures and fittings are included, and the cabin can be constructed by anyone with basic DIY knowledge. Alternatively, we offer a construction service if you would prefer someone else to erect it. Please note: We recommend an extractor is fitted to the inside of your cabin if you are considering using the cabin to house a hot tub. We also recommend that the inside of the cabin is protected with a waterproof coating to stop the formation of mildew. 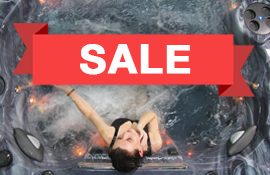 Please consider whether the roof beams enable enough clearance for the cover to be removed from your hot tub. 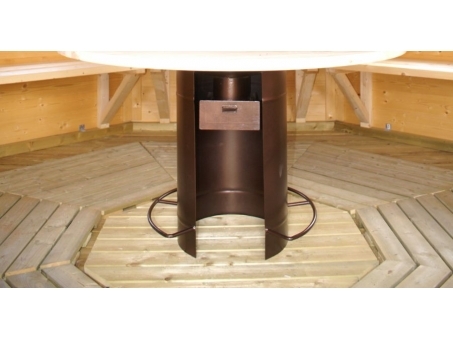 If you are fitting a hot tub, please consider there is enough room around the sides and rear of cabin for a cover lifter so you can remove and store the hot tub's lid. Also, that the any steps provided fit around the hot tub. 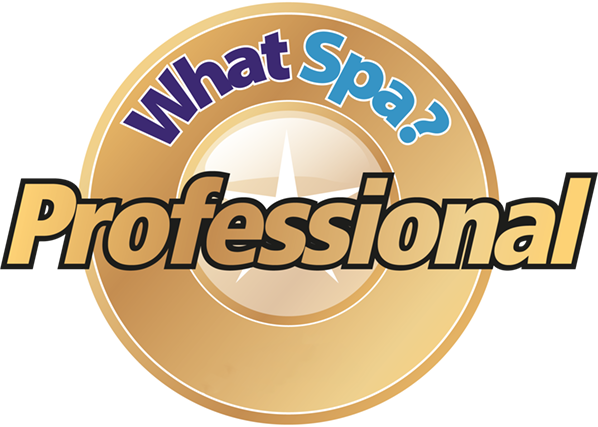 We will be pleased to assist you with any questions or technical information. We have a free downloadable installation guide for every cabin and offer a professional fitting and installation service. We have given as a guide, how packs of shingles you may need to weatherproof your roof. We also have great package deals on hot tub and cabin/gazebo combinations.Delivery to your preferred address is included within the price of your cabin. Our delivery vehicle has a Moffett and hi-ab facility to off load your cabin roadside. Our professional and experienced fitting team are available to unpack and assemble your building. The Award Team will complete the assembly from the first log to the last roof tile and they even take away all packaging. We will need a level, paved/concrete pad where the cabin is to sited. we will expect reasonable access enabling us to manually transport all of the building's materials to your preferred site. Delivery and felt is included in the price.